I know it’s basically the holiday season at this point and all but I still have to tell you this fabulous story about why I absolutely HAD to make this gluten-free vegan apple crisp on Halloween. We have some pretty amazing friends in our life right now and John and I LOVE getting together with them often to chat and laugh and eat delicious food. Well, two out of the six of our group are gluten-free eaters and another two of us are borderline vegan eaters (guilty as charged), but you just can’t go without apple crisp in the fall. You just can’t. Am I right? So I buckled down and did some research (and snagged some gluten-free flour from my friend Rebecca’s pantry) and came up with a delicious way to satisfy everyone’s appetites and dietary needs with one warm, sweet apple crispy dish. This apple crisp is about as simple and basic as they come, and though it’s vegan and gluten-free it’s just as delicious as any traditional version I’ve tried. Armed with non-dairy butter (Earth Balance, how I love thee), it’s totally dairy-free. And thanks to almond meal, gluten-free oats, and a gluten-free flour blend, it’s also void of the glutens. Good riddance, food allergies. Good riddance. Wondering what it tastes like? Warm, sweet apples, plenty of warm spice from the cinnamon, and the crispy, crumbly oat topping is just the bee’s knees. Top it with some non-dairy ice cream (or dairy, if that’s your thang) and dig in. Fall has never been so darn delicious (or healthy), I’m convinced. 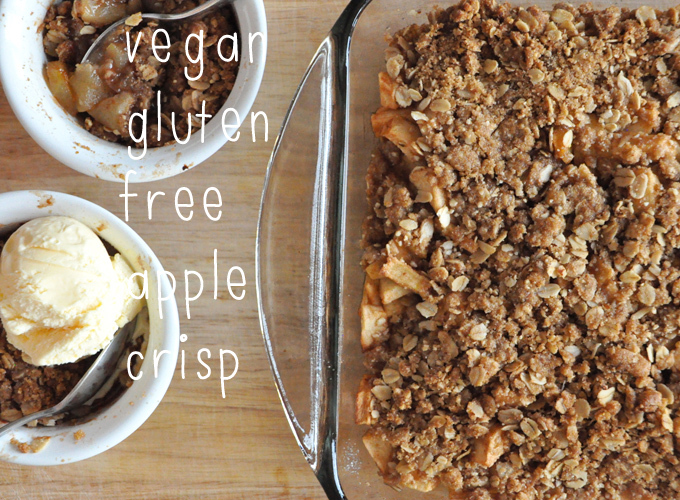 Vegan gluten-free apple crisp that has all of the warmth, spice, and sweet flavor of traditional versions. It's also ridiculously simple to throw together. Preheat oven to 375 degrees F (190 C) and lightly grease a 9x9 baking dish (adjust number/size of pan if altering batch size). Rinse and dry bowl and add brown sugar, flour, almond meal, oats, cinnamon, and salt and stir. Add melted butter and mix until it resembles wet sand. *There will be some liquid in the bottom of the pan, which you can either drain off or pour over the top of your ice cream. I have made this recipe twice now! We love it!It is my daughter’s favorite dessert, she has many food allergies. I sub gluten free baking flour for the almond meal. I played with recipe. Added chopped walnuts and raisins. I didn’t have any gf rolled oats so I substituted gf granola. Awesome. Thanks for sharing your recipe changes, Patti! Have made this apple crumble about 10 x’s since November, doubling the recipe each time. It’s been a HUGE hit!! Amazing recipe!! Subed coconut oil for vegan butter, gluten free flour for cornstarch, and some date sugar for half of sugar in apples. Worked like a charm! OMG! So I made a few changes – used apples and pears – substituted almond flour with pecan meal, added 1 tsp of vanilla and used regular unsalted butter. Gobsmacking good! I’ve recently become interested in cooking – your recipes make it fun and inspiring. Thank you! Whoop! Thanks for sharing your recipe modifications, Elizabeth! We are glad you enjoyed it! I didn’t have any almond flour so I just left it out. I used Bisquick GF pancake and baking mix. The results? Absolutely wonderful. My husband and I ate the entire Crisp at one sitting!!!! Great! Thanks for sharing, Toni! This was amazing! We picked apples at the orchard and had a hodge podge of varieties in our bag so I have no idea what types even went in- but it said a mixture so that’s what we did. We substituted almond flour for almond meal just due to not having almond meal on hand. My husband said this was one of the best desserts he has had and I agree! Made 4 giant servings but we actually got it to last for 8 servings. So good, thank you from our gluten free family! I have just recently joined the gluten free & vegan world! I made this dessert & my fiancé agreed it’s the best apple crisp he has ever had. Thank you so much! Look forward to trying more of your recipes! Whoop whoop! We are so glad you both enjoyed it, Alison! Hi Holly! We haven’t tried using vegetable shortening but if you give it a try, report back on how it goes! Good luck! This was my first ever completely vegan/gluten free dessert attempt and I have to say IM SOLD! I doubled everything and made a 9×13 for a dinner party and everyone raves. The topping was the perfect combo of crunchy, buttery, and sweet to compliment the tart first of the season apples we picked. I will be making this even when I DONT need a GF dessert! Thank you! Wow Great recipe! I am gluten free and I had to find a dairy free recipe because we were out of butter (GASP) and I needed one that worked well with coconut oil. Lets just say I will never think that I NEED butter to make a crisp again! this may have been the best crisp ever. I made a few changes because I didnt have everything on hand (added a pinch of nutmeg and ginger, used coconut oil, and used gluten free flour because I had no almond meal -but almond meal would have been better I am sure) I also used wealthy apples which taste AMAZING but are really hard to find these days. Excellent recipe. Thank you for sharing this with the world! I need some help. I’ve made it as written, but now I’ve a neighbor who is recuperating from a serious illness. Sometimes food gifts are overwhelming, so I want to freeze it in a disposable paper cake pan and have the topping in a baggy. Can you tell me or help me find out how to change the baking temp and time if cooking from frozen? Thanks for the recipe, How would I make this a peach and apple Crisp? Should I use half and half of each and how firm should the peaches be? Thanks! Hi Sam! We actually have a peach crisp recipe you might be interested in! I ended up making this recipe and it was a bit hit. I doubled the topping as suggested and was glad I did. I also subbed extra oats and flour for the almond meal. Thanks for the great recipe! I come to you first for my dairy free recipes. You don’t disappoint! Yay! Glad to hear it, Sam! Can I use brown rice flour in place of the gluten free blend? Hi Brittany! We haven’t tried and can’t say for sure, but if you test it out, let us know! Yay! Thanks for sharing your recipe changes, Anna! Absolutely Amazing!!!! Thank you. My husband and I LOVED it. Made this for dinner party with half suggested amount of sugar in apples and topping. Best crisp I’ve ever made. Everyone had seconds! Brown sugar is not vegan… has anyone tried a substitute? Great, just brought it to a pot luck pie party(in a pie dish) was one of the few to be completely eaten. Can you substitute coconut oil for the butter for a more healthy option? If so, how much coconut oil do you suggest? Hi! Yes you can, same amount as called for in the recipe! Delicious. I even used coconut sugar and it turned out great. Hello – can this be assembled day a day in advance and then baked the next day? Thanks! Hi Hillary! We haven’t tried it, but if you do let us know how it turns out! Thanks! Wanted to prep it the day before Thanksgiving – I hope I don’t wreck it! This is awesome. We’ve made in twice in the last two weeks. Second time making with few modifications: added flax meal to topping and a pinch of cardamom to apples. Its a very good recipe. Husband and kids loved it! Oats instead of almond meal. I did notice my topping was more wet than crumbly sand. I baked for one hour in a 8×8. Just wanted to see if u had any tips?! Hi Rosey! I would try cutting them a bit bigger next time and maybe adding a little less vegan butter! Hope this helps! I haven’t been able to find almond meal in my local grocery store – all they had was finely ground almond flour (the bob mill’s brand) – is there something I can substitute for almond meal or can I leave it out altogether? I will be trying it out tonight ! Hi Sehar! Yes! I would just suggest adding in more GF flour OR GF oats. You could also try coconut flour. Hope that helps! Thanks I tried this last night and added in a bit more GF flour – it turned out so good ! Much better than regular apple crisps I made in the past, this version is so much better! Instead of using white sugar, could I use Monkfruit Sweetener? Hi Sylvana! We haven’t tried it, but it should work! Hi! Can these be made into ramekins? Hi Missy! That should work! As far as the streusel topping, instead of regular brown sugar would something work like date sugar or coconut sugar? I’m not a fan of refined sugar. I am just starting to use alternatives for the first time for health reasons and I haven’t really experimented with replacing real brown sugar in recipes with any other healthier sugars. Hi Emily! Coconut sugar would work! This was ah-mazing! I subbed peaches and used Swerve sweetener as I’m diabetic. I brought it to a potluck with friends and everyone raved about it! One friend asked how I got the brown sugar taste in it, I don’t know, must be the vegan butter and cinnamon. Great recipe! Hi, I’m a bit intimidated by making the gluten free flour blend (and this would be the only recipe i use it for), trying to bake for a vegan friend. What could i simply use instead, could i use 1/4 cup of coconut flour for example in the flour blend’s place? The recipe looks delicious! But I can’t have a butter. Can I substitute for ghee? Will is still come out crispy? Hi! I have not tested it with ghee, but if you do, report back on how it goes! I made the Apple Crisp last night with ghee and although it was not bad – it was not great either. The topping came out kind of hard and this morning its soggy. It did not stay crispy as some other reviewer suggested. But I have to admit that although the consistency is more of an oatmeal it still taste great. Hi Lenka! When you tried it with ghee, did you use the same amount that the recipe calls for? I am considering trying it with ghee as well (as my daughter cannot have the sunflower ingredient in the Earth Balance butter nor can she have coconut). So I wasn’t sure if I should reduce the quantity to avoid it being soggy the next morning? I would like to make this again for Thanksgiving but don’t have time to do the whole thing on Thanksgiving day. Can it be made a day or 2 before and then reheated or will the topping get mushy? What would you suggest? Yeah! It will get a little more moist, but still delicious! Would you suggest I make the filling part before and then the topping the day of? Yes! Or at least leave it off until baking. Good luck, Diane! i just made it it is soo good! I prefer not to use a butter substitute. Would coconut oil work? Yum, came out just right! Getting used to this no gliten thing and I didn’t have any gluten free flour so I replaced it with oat flour (by food processing a half cup of oats into flour consistency). Easy peasey! I am not a cook by any means but tried this last night for some friends and everyone loved it! I only had a 10×10 baking dish which fit the apples fine but the topping looked too skimpy and didn’t fully cover the apples so I doubled the topping and it came out great! I couldn’t find almond meal so I used flax meal. Sensational! I also doubled the topping ingredients and it was the perfect mixture of crispy and soft. So glad I found this before Thanksgiving. I think my in-laws will love it! Thanks. I made this yesterday for 4 people and it was soooooooooooo good. I made a few modificatios in terms of the toppings as I like more toppings on these type of desserts. I actually used double the ingredients and then added half again! This recipe is very good but way too sweet for us. Maybe it depends on the type of apples you’re using. I used half granny Smith and half Jonagold. If I make it again I will decrease the sugar by half. This may be the yummiest thing I have ever eaten. I made a double batch for a potluck and people kept commenting on how delicious it was. I’m going to get more apples and make another one just for us! YUM! Great recipe but always find it very disappointing when read gluten free oats. For people with Coeliac disease there is no such thing as gluten free oats. From what I’ve researched personally, there is such thing as gluten free oats, it’s just that some people cannot tolerate oats. In any case, just leave out the oats and sub more GF flour and/or nuts. 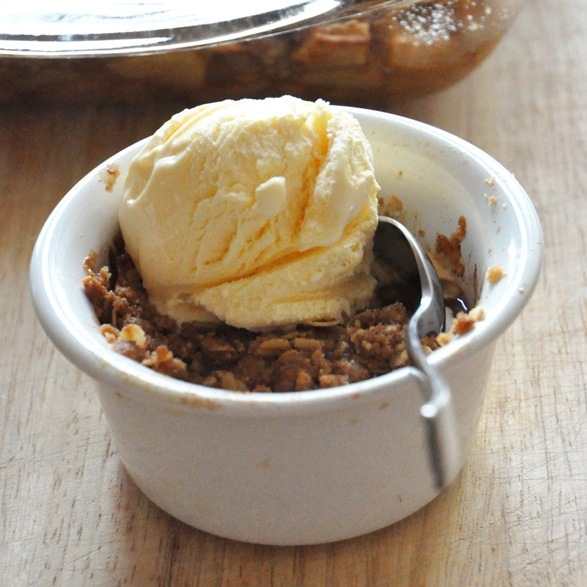 Best apple crisp recipe ever! I made only minimal changes: cut back on the sugar a bit, used Fleishman’s Butter for a non-dairy person who prefers this butter, and thanks go previous comments, doubled the topping. Delicious!! Thank you for the recipe, Dana! I’m a new fan. Thanks Shirley! Try this one next! That sounds amazing! I will definitely give it a try, soon! Thank you, Dana ;). 53 grams of sugar per serving?? Holy heck, no wonder it’s so popular, think of the endorphine overload! Looks delicious though. I have made this 2 times. I made some changes, not because I believed it was needed but because of what I actually had laying around. Changes I made were to use 1 type of apple, tapioca flour, butter and sliced almonds. It is always eaten quickly and everyone likes it. Hi, do you have any thoughts on what I could substitute for almond flour? I LOVE this recipe and make it a lot but bringing it to a potluck and a friend has a nut allergy. Thanks! I can’t wait to make this, I have a ton of almond meal I need to use. What can I use in place of the cornstarch? all purpose flour? Or gluten free flour. Absolutely one of the most delicious desserts I’ve ever made! Thank you for sharing! This is a fantastic idea!! I have all these apples on a tree outside. I’m going to make this this weekend. Persimmons too… I’ll have to figure out something for that. Thanks for the inspiration, looks delish!!! I have made this a dozen times and each time it comes out perfect!! I recommend this to everyone. Even fooled my no vegan friends who have requested the recipe. Perfect for all. I made this without the flour or almond meal (because I was lacking in both and was too lazy to go out *blushes*) and still turned out amazing! I also squeezed some lemon juice over the whole thing and sprinkled it with a bit more cinnamon and some nutmeg before baking it. Absolutely delicious with peanut butter nice cream, too! Can’t wait to make it again with the flour and almond meal! Thanks Anne Marie! Beautiful name, btw. Absolutely delicious. I brought this to Thanksgiving and left with an empty pan. Everyone loved it. They didn’t realize it was gf and vegan. I did a mix of pink ladys and honey crisps. I also used coconut palm sugar in place of the regular and brown sugar. This recipe is a keeper. Will definitely make it again. In all reality prep time is a good half hour. I just prepared it and I’m sure it will be delicious. I increased to 10 apples (cortland) and increased the other ingredients accordingly and placed in a rectangular glass dish. Found Earth Balance at Wegmans & using for the first time. Also I I did use 1/2 t vanilla and 1/2 t fresh lemon juice in topping. while the crisp was excellent, triple the topping for extra Apple-y goodness! The more crumble the better! I did the same but I found it to be too sweet. and for some reason my topping did not get to crispy. Can I freeze this dessert both topping and apple filling? I can’t find the size of the baking dish- please help- am cooking it right now! No almond meal? I just ground up some almonds in my blender.. worked perfectly! This is a delicious recipe!! Can you tell me how to make the topping crispy without using the quantity of margarine or butter asked for? The food blog world is interesting to me. It’s become as necessary to me as my gps. I don’t dare think about preparing a meal or dessert with out looking at my favorite food blogs. Yours and cookie and kate are my go-to blogs. I see you two refer to each other from time to time. I love that! 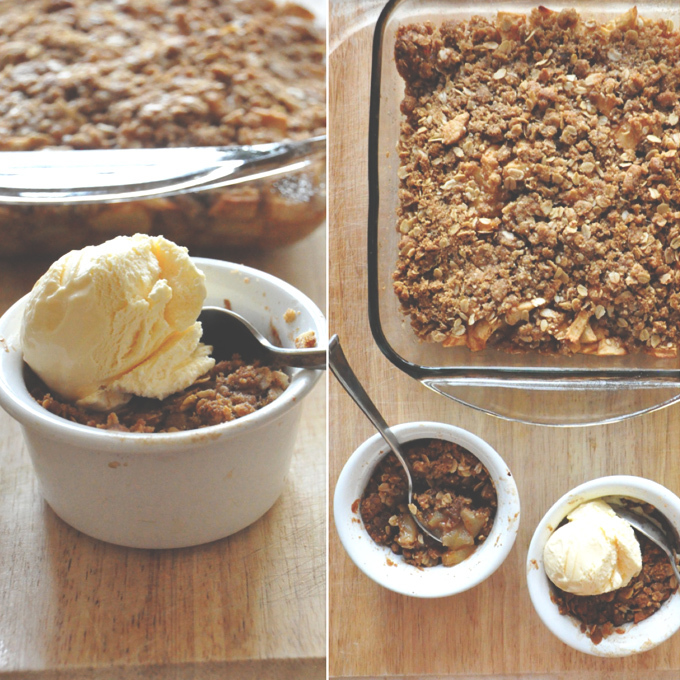 This apple crisp recipe was truly amazing. I read commenters say it was their favorite and I was like, ‘C’mon, apple crisp recipes are all the same’ but this one truly was better than any other! I think the almond flour in the topping added a huge flavor boost. And we made your vanilla ice cream to go with it. And your coconut whipped cream. It is wonderful to have so many delicious dairy-free options as dairy-sensitive folk. I searched your site for a salted caramel cupcake recipe and couldn’t find one, but I did find your funfetti cupcakes and your salted caramel truffles recipes, which I’m sure will be a huge hit. Thanks, Dana! This recipe is AMAZING! A great substitute for almond meal (if you can’t find it) is to throw raw almonds in a food processor. It’s great with soy ice cream and Vermont maple syrup. Super yummy!! Left out the almond meal and added a little more GF flour. Everyone including the gluten lovers gobbled it up. I made it in an 8×8 dish and worried there wasn’t enough topping but there was plenty! This will be a go to recipe from now on! If you don’t need it to be gluten free can you just use the same amount of regular flour that the recipe calls for GF flour? What do you recommend as a substitute for almond meal in this recipe? My daughter can’t do nuts. Cannot wait to try this recipe out!!! this is fantastic inspiration, though much like a few other reviewers, i found that i have to triple the amounts of crisp that the recipe calls for. nice for peaches as well. it’s a wonderful dish to share at home or bring to get-togethers with vegans & omnivores alike – this dish is even more proof that indulgence and responsible eating are not mutually exclusive! Great recipe! As others have said, highly recommend doubling the Topping. I also left the apple skins on and turned out fabulously. I love the flavor of these cookies, but every time I make them, they crumble. Can’t make them stick together. Any idea what I may be doing wrong? Use coconut sugar. It’s vegan and light brown in color. Mind that the light brown sugar is often coloured with caramel sirup, which is a derivate from wheat. So then it is NOT glutenfree!! First recipe I’ve tried from this site after browsing through it for the past few weeks! I have to say I was worried when I mixed up the topping – I followed the recipe pretty much exactly (only subbing butter for the vegan fat) and the consistency of it was about that of wet muffin batter. Definitely not a consistency you can “sprinkle” like the directions say – so I added about 1/3 cup more oat flour and it was still not sprinklable at all. Also I only had 5 medium-ish apples and put the in a square 9×9 pan, and the batter was not enough to fully cover them. So yeah..I was not sure! But in the end it baked up pretty nicely into a sort of firm oatmeal cookie-like top, with enough topping for 5 apples. I’d definitely think about doubling the topping if I were using 8 apples like the recipe says. 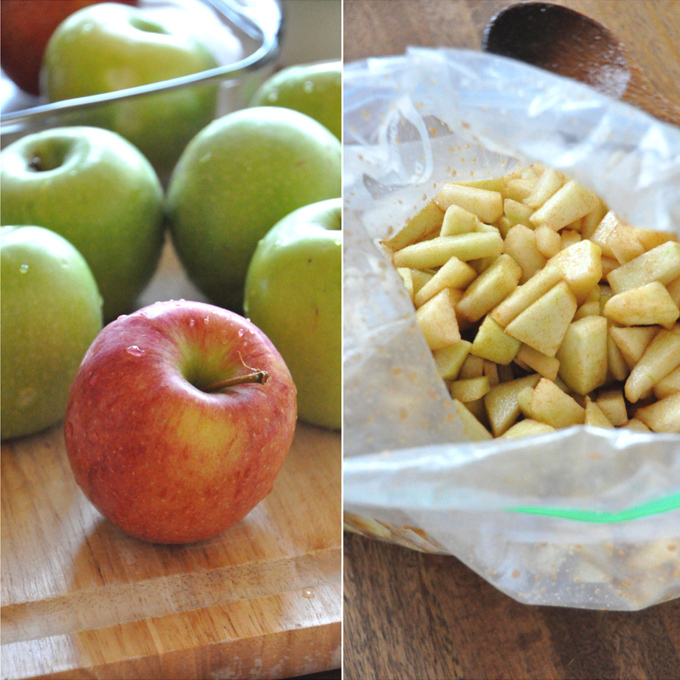 Lastly – I left out the sugar that is supposed to be mixed in with the apples, and I found it plenty sweet! what can I substitute the sugar AND brown sugar for? Could I substitute the brown sugar for coconut sugar and the sugar for honey? What would you suggest? This recipe is delicious and it was hard for me not to eat the whole batch in one sitting! Thanks for sharing. ha! That’s when you know it’s a winner! Thanks for sharing, Seth! This looks amazing! I would love to make this for a dinner party that I’m throwing! Do you think I could substitute coconut sugar for brown sugar? I used coconut sugar and it was great. I cut the amount of sugar in half; we don’t like anything too sweet. I also tripled the crumb recipe… It’s the best part ? what sugar did you use to coat the apples in? i’m thinking of using coconut sugar for the crumble but not sure what ‘healthier’ sugar substitute i could use for the coating of the apples? The dinner rolls look amazing, I’ve been vegeterian most of my life, vegan for a few years, also have to be gluten free. GF, vegan bread of any kind is just nasty, at least that is my experience. Will the rolls look that good and taste good if GF flour is used cup for cup? This recipe is fantastic! I made it for Thanksgiving yesterday and got rave reviews. I added cranberries, 2 TBS of orange juice and orange zest. I also doubled the topping which was perfect for a 8×11 pan. Thank you so much, I can’t wait to make it again! I made this for a dinner party last week and my guests and I were amazed at how tasty it was, especially as it’s vegan AND gluten free. It’s every bit as good as a ‘normal’ one. I’m also obsessed with your summer corn soup. I went vegan 4 months ago and this blog has been a great resource for delicious recipes that don’t have overwhelming ingredient lists. Thank you! This recipe looks promising. Can you suggest adjustments I might make if I choose to use raw agave instead of sugar? The photos are beautiful, too. Thanks. Made this tonight for company-with coconut vanilla cream. Was a MAJOR hit! Thank you. Lovely! Glad you all enjoyed it, Nora! This was delicious! I live overseas and can’t get my hands on vegan butter of any sort… Tried making it with canola oil and it was tasty but too greasy, but a redo with a combo of ground flaxseed and about 2 Tbsp of oil, plus enough water to hold it all together, was perfect. The crisp ended up crisp-chewy in a really delightful way and it tasted so great we devoured it all before it even had the chance to cool completely! Thank you! I just made a double recipe of this. I used my Vitamix dry blade to grind up the almonds into almond meal…that took 8 seconds! 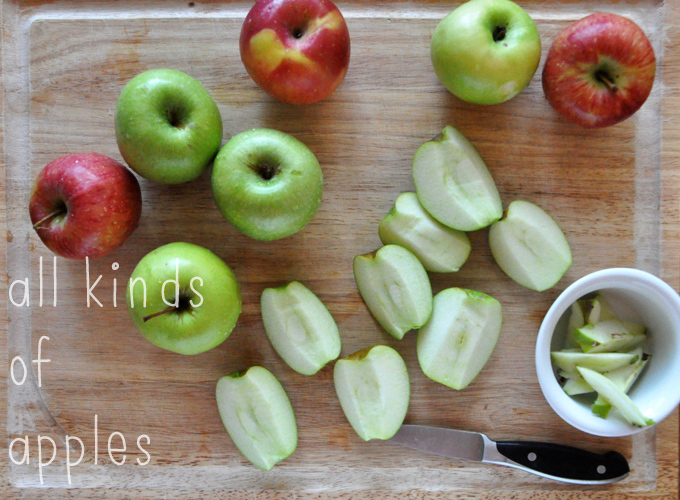 I agree that you should make almost double the topping mix, though, in order to cover all the apples. I used quite a bit more cinnamon and more lemon juice, too. Awesome recipe, yum!! Just made this last night – it was amazing!! 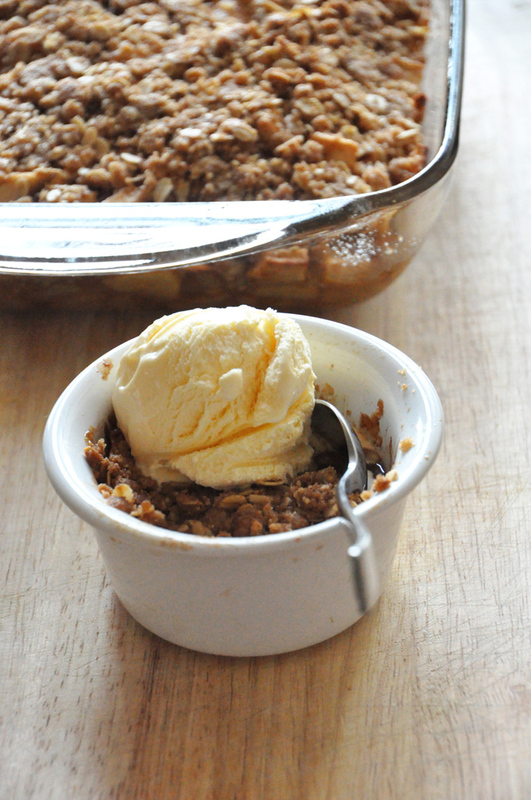 Even better than regular (non-GF) apple crisp! Delicious – thank you!! This recipe is amazing! Thank you! My husband and I ate the whole thing in about 20 minutes (blush)! Thank you so much for this fantastic recipe! It turned out amazingly and my friends all loved it. I substituted more GF flour for almond meal as I couldn’t find it, and it worked very well. Could I substitute coconut oil for the Earth Balance in the topping? Same amount of coconut oil as earth balance? Had my vegan gluten free friends over for dinner and this was a huge hit even for my meat and dairy loving husband! Like others, I doubled the topping because it’s our favorite part and added pumpkin pie spice because I love that flavor. Addicting! So good. So easy. Vegan and GF. Awesome. Of course I cooked it in a cast iron skillet. What if you can’t have oats??? I am still allergic to the gluten free oats. Any suggestions? Sub more almond meal and gluten free flour blend! + some raw pecans. I just made it and I loved it! I only added almond flour and oats as I didnt have the rest of the flours but it turned out very good. Next time I would add less sugar or use honey instead. Thank you!!! Everyone LOVED this!!! So easy too. I didn’t peel the apples. I made this for a BBQ tomorrow. Is it ok to leave out or does it need to go in the fridge? I’d say it’s OK to leave out. But if you’d rather refrigerate it, you can do so and then just reheat the whole thing at 350 degrees until warm before serving. Hope that helps! Thank you for posting this. Our apples are just days from being ready to pick. (*Just a side note if you want to make a truly vegan dish be careful of the sugar you select. Great recipe. I substituted gluten-free cornbread mix for the meal and flour, cut back on the sugar, and added nutmeg and cardamom. Yummy! Lovely idea! Glad you enjoyed it, Joanna! Just made this, SO DELICIOUS! Thank you! I tried this recipe today and it turned out gorgeous. I accidentally used coconut flour instead of almond flour and that worked really well. I am definitely going to make this again. This was just what I have been craving! Thanks so much it was and is fantastic! We loved this! I added chopped toasted pecans and it was awesome. I was a little heavy-handed with the cinnamon and the almond meal and it was great. I also only put about 1TB of sugar in with the apples. I made this recipe last night for a large family gathing. I used this instead of a family recipe since we now have quite a few gluten free and wheat free folks in the family. Couldnt find almond paste in the store, so I put a half cup of almonds in the coffee grinder ;-) Everyone really loved it. Oh and I tripled the recipe with no problems at all. So glad to hear! Thanks for sharing, Ben! Great recipe. I may eat it all up in one sitting. I’ve been baking apple crisp for 35 years and recently had to look for a gluten-free recipe for my daughter who’s just begun a gluten-free diet. 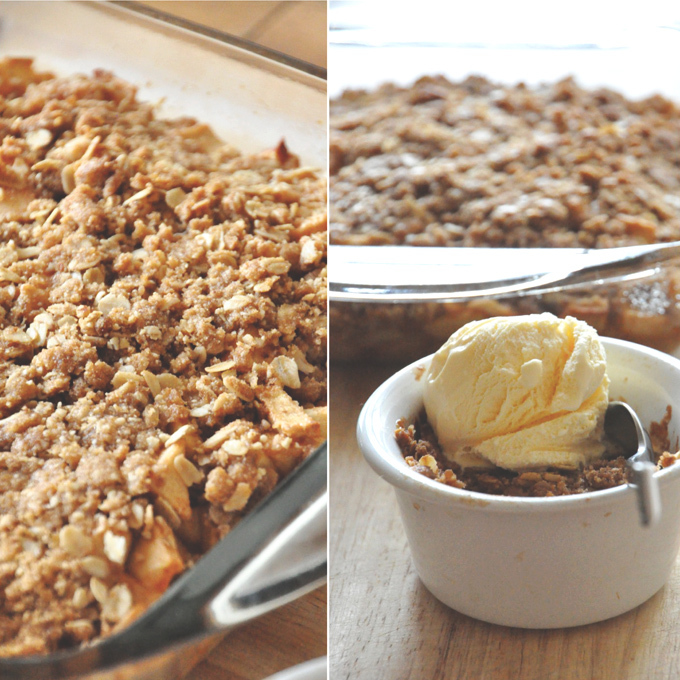 Hands down, this is the best apple crisp recipe I’ve ever eaten. I think the local fresh Macoun apples help….but I will NEVER go back! Thanks so much. It’s absolutely delicious! Yay! So glad you liked it, Kathleen. Just made this recipe……………………..AWSOME! I did add some frozen blueberries. I substituted a few items for similar ones I had in the pantry already. AMAZING! We had a family with 3 kids over (and they are not gluten/dairy free like we are). Kids asked for seconds! Thank you for the scrumptious fall dessert recipe! Delicious! I doubled the topping because it was not enough to cover the fruit. I think next time I’ll cut the sugar by half. Thanks for inspiration. I just made a peach blueberry crisp using this topping. Our gluten-free family liked it! I replaced the brown sugar with stevia (to make sugar-free) and had to quadruple the recipe to fit my 10×13 crisp pan. I don’t know but we like a lot more crisp to fruit ratio. Thanks for posting so we could have a fun dessert for our newly-minted gluten-free 8 year old! Nothing short of a totally fantastic recipe; most GF folks have all of these ingredients on hand! I substituted arrowroot starch for the almond meal and added extra cinnamon, and everything turned out awesome. Yum! Looks delicious and your pictures are beautiful! If you are allergic to nuts, can this be made without almond meal? Do you have any suggestions for a substitute? Yes! I would just suggest adding in more GF flour OR GF oats. Hope that helps! I substituted ground flax seeds in place of the almond meal. Worked great! I used coconut flour in replacement of tbe almond meal… was awesome! The only thing I would suggest is to cover the dish with aluminum foil for part of the time in ove as after about 35 kins in the oven, it burnt parts of the crust…otherwise amazing recipe! Will def re make soon! Thanks! I have a bunch of coconut flour I want to use, and wondered if I could sub it!